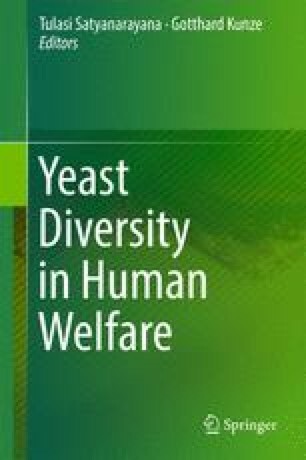 Until recently, the methylotrophic yeasts, including Hansenula polymorpha , have not been considered as a potential producer of biofuels, particularly, ethanol from lignocellulosics. However it is already known that the thermotolerant methylotrophic yeast H. polymorpha is capable to ferment xylose , glucose and cellobiose , the main sugars of lignocellulosic hydrolysates , under elevated temperature. These observations allow considering H. polymorpha as a promising organism for high temperature alcoholic fermentation in industrial applications. Although the amount of ethanol produced from xylose by the wild-type strains of H. polymorpha is extremely low, the successful approaches of metabolic engineering and classical selection had been developed during last decade, which permitted to increase ethanol accumulation from xylose 30-fold. The available strains accumulate 12.5 g of ethanol per liter from xylose at 45 °C. In this article, we present published and new approaches and main achievements on metabolic engineering and selection of H. polymorpha for improved producers of ethanol from xylose, starch , xylan , and glycerol, as well as that of strains with increased tolerance to high temperatures and ethanol. This work was supported in part by National Academy of Sciences of Ukraine (Grant Nos 5–17, 6–17 and 35–17) and Science and Technology Center in Ukraine (STCU) (Grant 6188).